These brine flows are discussed in two recently published papers in Nature Geoscience, one with indirect evidence and the other with direct evidence of hydrated perchlorate salts (ClO4- . xH2O) within the RSLs. by the Compact Reconnaissance Imaging Spectrometer for Mars (CRISM) on the Mars Reconnaissance Orbiter (MRO). The process by which the RSLs form is called deliquescence, the same process that clogs your salt shaker with hydrated salt. As the salt sits on the surface of the planet, it absorbs water vapor from the atmosphere, which causes the water (through freezing-point depression) to maintain its liquid phase even in the low pressure, low temperature conditions on the surface of Mars. In fact, at concentrations observed on Mars, perchlorate salts lower the freezing point of water by up to 80ºC (that’s 176ºF!). This mechanism isn’t the only proposed explanation for the RSLs. Others speculate that the water could come from surface ice melting in the presence of perchlorate salts or underground water seeping through to the surface. Illustration of the various phases of water on the surface of Mars compared to that of Earth’s surface. The surface temperature of Mars, based on the Viking landing sites, are believed to be between -60 and 27ºC. 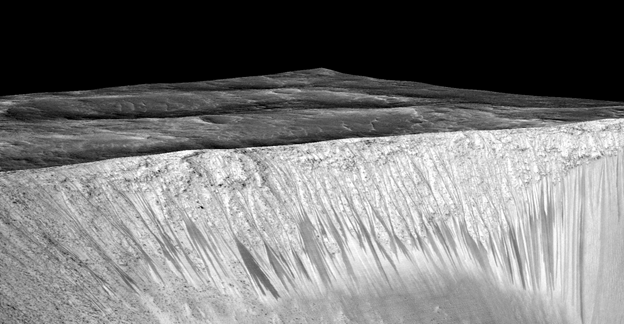 The discovery of liquid water on Mars is not only exciting for the aspect of finding Martian life. It also is exciting when you think about sending humans to Mars. Clearly, life on Earth needs water to survive. The astronauts we will eventually send to Mars in ~2030s will need a reliable source of water, but also a reliable source of O2 to breathe. Finding liquid water in the form of brine could allow astronauts not only to purify this water into fresh drinking water, but potentially to use the perchlorate salts as a source of O2. Why does perchlorate work as a source of breathable oxygen? The perchlorate anion, ClO4-, is completely stable when dissolved in water. However, its solid anhydrous state can be very unstable to shock. Taking ammonium perchlorate NH4ClO4 as an example, a hit with a hammer of a crystal, or even twisting open the bottle with a crystal stuck between the threads, can cause the following highly exothermic and entropically favorable reactions, depending on the temperature. Side note, most fireworks are built with various metal perchlorates, where the metal cation dictates that color that you see! In the perchlorate ion, the chlorine has its density of electrons pulled away by four oxygens, creating a +7 oxidation state on the chlorine. For comparison, chlorine is most commonly found as the chloride anion (e.g. NaCl, or table salt), where the oxidation state is -1. 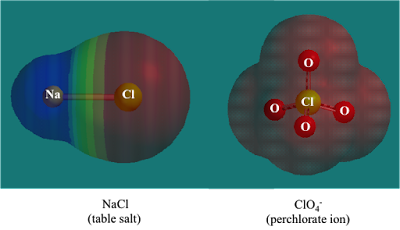 Typically, the electron density in a molecule containing chlorine gets pulled toward the chlorine. 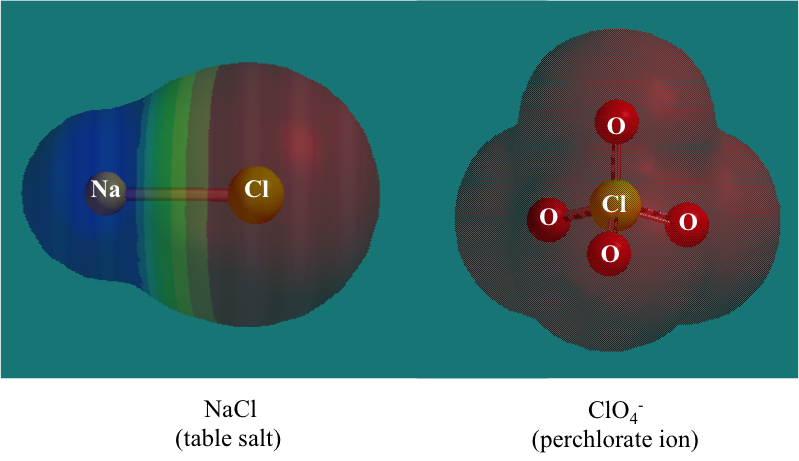 However, with four oxygens surrounding the chlorine atom in the perchlorate anion, the electron density gets pulled away from the chlorine toward the oxygen. Because chlorine is highly electronegative compared to most atoms on the periodic table, having a lot of its electron density pulled away by four oxygen atoms in ClO4- makes it very unhappy. from blue to red. Images and calculations made in Spartan. Although direct evidence for ammonium cation being associated with perchlorate anion has not been observed on the surface of Mars, there is strong evidence for Mg(ClO4)2 and NaClO4. 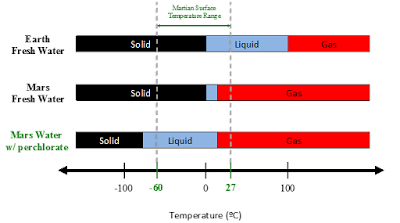 In addition, experiments on the Sample Analysis at Mars (SAM) instrument onboard the Curiosity Mars Rover (they unfortunately did not name it after me, but a man can dream…) have strong evidence that supports mixtures of Mg(ClO4)2, Ca(ClO4)2, and/or NaClO4 and iron-rich Martian soil produce O2 in significant quantities between 225 – 461ºC (437 – 862ºF). Additionally, perchlorate salts can be easily extracted with anion-exchange resins, which can allow astronauts to more easily purify any brine to drinkable water. This also allows them to purify the perchlorate salt into a powder, which is required for decomposition into molecular oxygen. 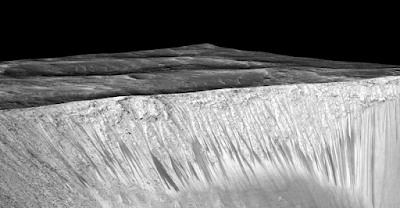 Although many astrophysicists and astrobiologists (yes, that’s a field – and it’s awesome) have expressed overwhelming excitement for this new discovery on Mars, others might argue that finding water is not all it’s cracked up to be. For example, we have no direct evidence of the precursors to life such as amino acids, DNA, RNA, etc. Although I agree that finding evidence for these compounds would be an enormous jump in our search for life on Mars, a more acute and still very exciting impact of finding direct evidence for liquid water in the form of hydrated perchlorate salts on the surface is that we are now closer to supporting life on Mars, particularly for astronauts that we send there from Earth. We also have more confidence that some of the elements that we know can support life as we know it are also present on Mars, boosting the probability that life does or once did exist on that planet. Through NASAs direct measurements from the HiRISE experiment on the MRO, the SAM instrument on Curiosity, and the spectroscopic measurements of RSLs from the MRO by the Compact Reconnaissance Imaging Spectrometer for Mars (CRISM), we now have a deeper understanding of ClO4- salts on the surface of Mars, and can start to design our missions to produce our own oxygen and drinking water from the elements that exist on the Martian surface. If you didn’t catch all of those acronyms, don’t feel bad; I had to look up most of them while I was writing that sentence. elektrische Pfeffermühlen oder auch electric Peppermills. Fantastic blog.Really thank you! Cool.